I’m celebrating 50,000+ views on my blog (Thank you! Thank you!) and the 50th anniversary (published 1964) of Charlie and the Chocolate Factory by Roald Dahl, published 1964. 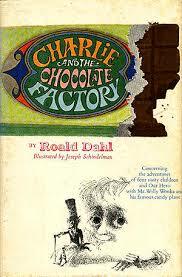 Loved with this book, then I saw the movie, Willy Wonka and the Chocolate Factory – my mind was forever altered. I still love the 1971 Gene Wilder version best (directed by David L. Wolper), maybe because it’s steeped in childhood memories or because for me, it’s Gene Wilder’s definitive performance. This is where I fell in love. Gene Wilder and chocolate. Sign me up! Wilder is the ultimate Willy Wonka. He didn’t go over-the-top weird, instead opting for a subtle, damaged man-child who was trapped in his own reclusion, a Howard Hughes-like creative genius who couldn’t cope in a reality that wasn’t of his own making. Wilder’s transcendent blend of cordiality, callousness, awe, and animosity make you think he is Wonka, he just is. Jack Albertson was delightful as Grandpa Joe, who apparently couldn’t get out of bed to get a job, but could dance a jig and spend the day at a chocolate factory. Charlie Bucket is the only child Dahl and Wonka even remotely like due to his meek and accommodating nature, but Charlie wasn’t as obedient as he seemed, he spent money on a chocolate bar that he wasn’t supposed to; so even in the most co-operative child Dahl found a fault. The 1971 version was renamed Willy Wonka and the Chocolate Factory to cross-promote UK’s The Willy Wonka Candy Company who had bought the rights from Roald Dahl. I never understood why Roald Dahl was classed as a children’s author, he clearly disliked children, at times rather intensely. His stories and books reflect this. What he hated more than children were their parents, specifically parents who didn’t raise their children properly, at least from his point of view. Imagine what Roald Dahl would think of children and their parents now? I recently read A Brief History of Chocolate (Steve Berry and Phil Norman) which I must warn you will not only vastly entertain and inform, but make you crave chocolate. Despite best intentions this book lacked something, what was it? Oh yes, chocolate. They should sell each copy with a chocolate bar or coupon for a free chocolate bar. There, a marketing idea, no charge…although I’d take a thank you in chocolate bars. I also loved the darker, creepier Tim Burton vision of Willy Wonka. Johnny Depp played him weird and it worked. Also damaged, but in a deranged-metrosexual-game-show-host-who-moonlights-as-a-rock-star-on-acid-way. 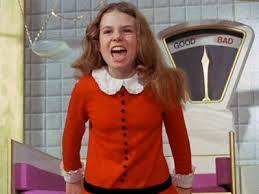 Veruca Salt was a bad egg or nut in all versions, but really, her parents spoiled her. Also, Augustus Gloop, Mike Teevee, and Violet Beauregarde. All annoying children, but allowed, even encouraged to be so by their parents. The first time I walked into the Hershey chocolate factory in Smith Falls, Ontario the smell was divine, like melted chocolate floating through clouds of more chocolate just before it rained chocolate. I’ll never forget the look on my son’s face, the pure wonder as he watched row after row after row of Reese’s Peanut Butter Cups racing happily along the conveyor belt. I’m sure I had a similar look as I saw the giant vat of chocolate I wanted to swim in, not figuratively, literally. No Oompa-Loompas, no chocolate waterfall, trees made of taffy, Everlasting Gobstoppers, no fizzy lifting drinks, or Wonka though, but lots of chocolate for sale and sample. 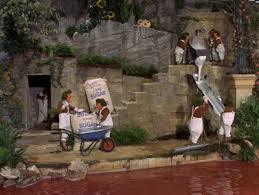 Alas Hershey closed the factory after 45 years, losing a great tourist attraction, and hundred of jobs. Several other large employers closed, shipping more Canadian jobs overseas, leaving 40% of the town unemployed. Now a flame has been lit as Smith Falls rallies; the factory at 1 Hershey Drive now produces medical marijuana, which, in a great cosmic irony would have made more people buy chocolate. There are still times, when I open a chocolate bar wrapper and think I see a flash of gold. This movie brings up so many nostalgic memories. It was a major kid fantasy: a completely edible room! I really didn’t embrace the newer version (not a fan of Tim Burton). I think I saw this movie(1971 version) about 10 times in the theater!! Just loved it! I, too, liked to re-make. I wasn’t sure if anyone else could do it justice, but it works. You’re silly! I hope you’re headed over to my blog to join this Pitch Party I’ve got going. I want my followers to know more about your blog. Get over here!!! I have to think upon my pitch dear sir…any ideas how to describe my rather eclectic blog? Okee dokee. Bring ice cream! I’ve got some ice cream waiting for me in the freezer. I’m going to need it…this pitch party has got me running in ten different directions at once! How have you managed to maintain so many followers? Pray tell… How did you get to 50,000+? I am a tourist from the Pitch Party!! And I to LOVE chocolate. Any shape, size and form!! I actually wrote a poem about it!! I look forward to following you!! It was my pleasure!! Any fan of chocolate is a fan of mine; and thanks for stopping by!! I loved the 1971 edition and felt the more recent one didn’t have the same element of magic. Perhaps I was spoilt by the Gene Wilder version. I was out of town visiting family so I tried to stay offline as much as possible, this was a lovely surprise when I got home!!! Dahl seemed to pretty much hate everyone, this is a good example of why I more often than not prefer to know less about ‘celebrities’ (the last few weeks/months have probably shown people that quite clearly). Talent or charisma or even just fame can mask real ugliness. Ahhh such a fun post, and perfect for #FridayFrivolity this week!! Loved this line the best though: “Johnny Depp played him weird and it worked. Also damaged, but in a deranged-metrosexual-game-show-host-who-moonlights-as-a-rock-star-on-acid-way.” Hysterical, and so apt! Pinning and tweeting.